LGBT Student Scholarship Capital Campaign $150,000 Milestone Achieved! GALA ND/SMC hosted the 2019 LGBTQ Leadership Award Weekend to recognize and honor LGBTQ leaders in the Notre Dame and Saint Mary’s community. The celebration took place Friday March 29th through Sunday March 31st. Included in the weekend’s events were an Alumni/Student Networking Event, an Academic Panel and the Tom Dooley/LGBTQ Leadership Award Dinner & Ceremony. For a complete weekend recap, including images press coverage and videos, go to 2019 LGBTQ Leadership Award Weekend. In conjunction with the ND Department of American Studies, GALA will host a panel discussion called Solidarity & Identity during the 2019 LGBT Leadership Award Weekend. In his book, Fr. Martin’s call for ‘Bridge Building’ between the LGBTQ community and the institutional Church echoes the Catholic Social Teaching principle of Solidarity. Readers are invited to examine the experience from each side’s perspective, and to find common ground to move forward. Solidarity is not just a faith concept – it is also a method of political change. 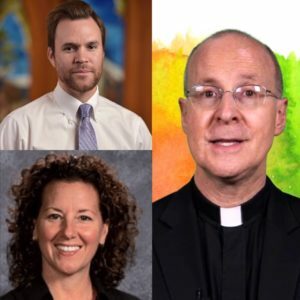 Past and current movements in the LGBTQ community and the church have built solidarity with other communities, such as immigrants or the labor movement, in their fight for civil rights. Solidarity speaks to our ideas of dignity, faith, and the common good. Our panel will explore different examples of movements and reach toward an understanding of their goals, results, and philosophies. Speakers Include: Fr. James Martin (via Skype), Professor Michael Hebbeler, and Shelly Fitzgerald. 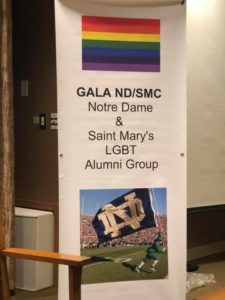 Copyright © 2012-2019 The Gay and Lesbian Alumni/ae of the University of Notre Dame and Saint Mary's College. All Rights Reserved.